I respect where you're coming from, and a simple heads up that an item may have been, or is on sale someplace is a nice thing to do. But, beyond that, I think nothing else needs to be said. This is a buy and sell section and a person has every right to ask what they feel they want for an item. As buyers we can pay, choose to look else where or even bargain. Coppa has every right to even profit on shrewd buy, if that happens to be the case. The fact that you would'nt pay more then $200 for this reel is irrelevant. Ross makes a great product and its upto the purchaser to do their due diligence and decide what its worth to them. I don't think it's necessary to dissolve into this petty back and forth. Unless you know something illegal is occuring or have had a bad buying experience a particular seller I think it's unfair to hijack someone's 'buy/sell' thread with unsubstantiated allegations of wrong doing. #306369 2014 Opener! Lets See What You Got! 1) It seems that a lot of people concerned with numbers. When did fishing become about keeping score. Too many people missing the point IMO. 2) There is blatant mishandling of fish. 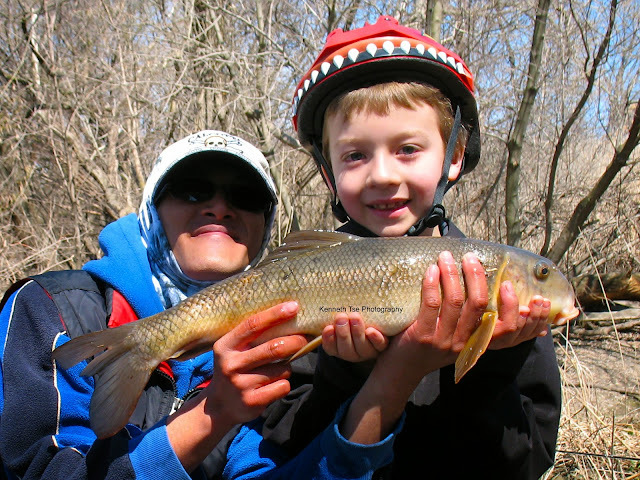 Fish laying bleeding on the ground, fish in the mud, fish in the grass, fish being held by the gills; all bad examples of how to properly handle a fish. I realize that these are hearty fish, they wouldn't be able to make this annual journey if they weren't, but lets remember that as river fishermen (and women) we are targeting these fish at their most vulnerable. I'm not some kind of bleeding heart activist, and I'm not trying to stir up any bs, I'm simply asking that we show a little respect to the amazing fish we chase, and that we set a good example for the new generation of steelheader that may be browsing this thread. Personally I love all things steelheading, and want to make sure that my children have the same opportunity to fall in love with these incredible creatures. Hey guys, I get a lot of questions about how to get started bass fishing beyond the simple ugly stick and spinning reel combo. How do I prep to fish deeper water with cranks? How do I get fish out of the heavy cover? Realistically to anyone who is not as serious as I am or most others, there are 3 basic rods that you should look to invest and 3 reels along with them. 2. I also recommend getting a nice spinning rod 6'8 or 7'2 Extra Fast Action. This can be your rod for tossing wacky senkos, tubes, drop shot, finesse shaky heads. For this situation I love pairing up a shimano Crucial with an Abu Garcia reel. The Crucial is great but only if you buy it used, do not pay retail for it. If you have the extra cash to spend on a reel, the Abu Garcia Revo SX spinning reel is amazing! Suggested on my end. 3. Now the fun part. I am a big fan of flipping a jig into that cover, or punching a tungsten skirted weight with a creature bait on the hook. If you really do not want to spend too much money, the Abu Garcia Veritas 7 ft Heavy Fast Action rod is a great start. For 79.99 they are very reasonable. Again if you can find it used BUY IT. I am sure you can snag one for 50 bucks. Make sure that the baitcaster you pair it with has a ratio of 7.1:1 at least. These are the basic 3. You do not need to spend over 500 bucks on all sorts of rod and reels and different baits. You can easily fish a full day on the lake with these 3 types of set ups. Now if you have money and are willing to get yourself a full arsenal then I support you! Cheers and thanks for reading if you took the time. Do not forget to green arrow if you liked! #281282 Salmon in the rivers yet. Bass if you ask me are garbage, they arent hard to catch, can be found in most still waters. Not much of a fight. 18lbs line to catch a 2-7lbs fish. Right where is the challenge? Go to a lake, look for lilly pads, branches in the water a bit of shade and BAM there is Bass. They can populate a lake in no time they are not illusive, they are not spooked very easily. If this hurts your feelings. Call Dr.Phil. lmao Thats about a ignant as it gets. You should fish bass tournaments with all that valuable knowledge you have. Guiga, as for your question; since these fish are migrating it would make the most sense to fish areas closer to the mouth after a good rain, as the water levels drop you can either fish higher up in a system for fish that have already migrated from the previous run, or you can fish at the piers for staging fish that will be running after the next rise in water levels. Of course this is a general rule and can be vary slightly depending on the time of year. The fish that are running now are headed as far upstream to cooler water as possible and wont hold in the lower sections as much as they will be come autumn when we get cooler, more favourable water temps. 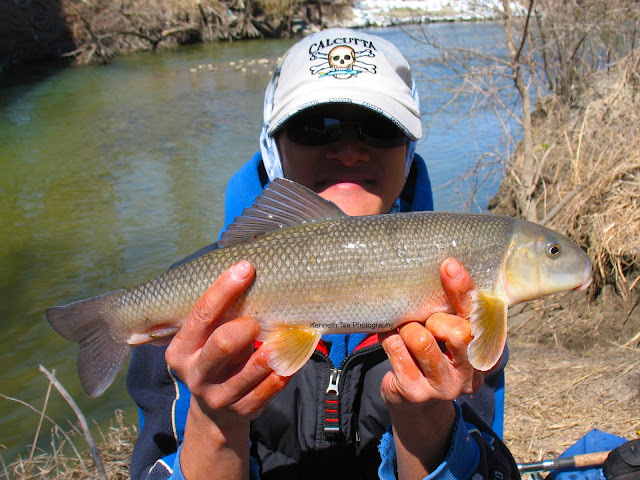 Best thing you can do is keep fishing your home waters, get to know them intimately, keep a close eye on the weather and river conditions and it will all come together for you. These fish are no where near as ILLUSIVE or difficult to catch as some believe they are, with practice you'll get the hang of it. And there's nothing wrong with asking for help, don't let others discourage you. this is what you call fun? trolling our forum? posting nonsense? Have you ever posted a successful report or has it all just been brand bashing, harassing and flaunting new gear ? First off, nice fish regardless of actual size. Good couple hours of fishing. According to average ear length the fish is: 26.46"
According to average visible eye width the fish is: 26.25"
So, my crackpot science sort of confirms that the fish was a BEAST! nice catch. 26" would still be a mutant smallmouth. Do your measurements take into account that the fish is being held out in front of the fisherman? A picture can make a bass look longer than the CN tower due to positioning.. Hence crackpot science as rybak stated. His method of estimation is only believable if and only if you compare two objects that are within the same plane in the photo. For example...measuring a segment of a finger that is held against the body of the fish. But...it does prove a point the fish was over estimated. Certain common objects can offer some estimate of the fish...regardless of how big or small the person in the picture may be. People often claim they are such and such height and weight and grossly overestimate fish size. I just had to look at the size of the ball cap visor and say BS because an unbent ball cap visor is usually 7"-7.5" wide. When bent, it ranges from 5.5"-6.5" wide...depending on the size of the "roof top". 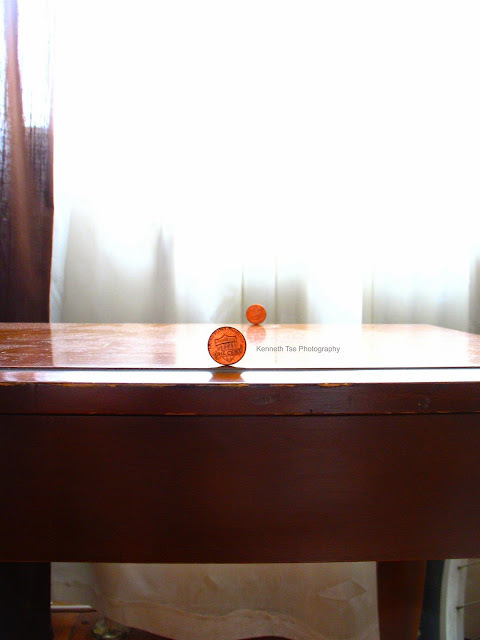 2 American pennies (Don't have Canadian pennies anymore ) set on a piano bench exactly (measured) 12" away from each other in "depth", and 1" slightly offset with each other laterally. First picture was taken with the camera lens set exactly (measured) 22" above ground, and exactly (measured) 12" away from the closer penny (and exactly 24" from the further penny). This is a fairly unrealistic situation where the object (fish and angler) is so close to the lens...but use here to illustrate a point. In this case, the closer penny is 191 pixels in diameter, while the further penny is 101 pixels in diameter. If we use the further penny as comparison for "actual size", then the penny that is closer is enlarged 89%...it almost doubles in size! I don't really need to tell you that. You can probably see that the penny that is further away is 1/2 the size. OK...let's bring the camera back from the pennies. 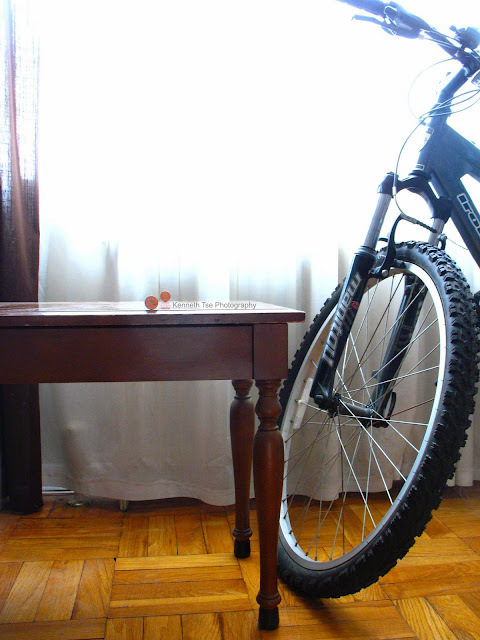 Second picture was taken with the camera lens set at the same height (22"), and exactly 36" away from the closer penny (and exactly 48" from the further penny). In this case, the closer penny is 68 pixels in diameter, while the further penny is 51 pixels in diameter. Again, using the further penny as comparison for "actual size", the penny that is closer is enlarged 33%! Again, I don't need to tell you that the penny that is further away is about 3/4 of the size. So...as you can see, the enlargement factor is quite severe. I don't think I need to tell anyone that holding a fish closer to the lens makes the fish look bigger...but I don't know if people are aware just how much "bigger" the fish looks. The further you set apart the pennies, the bigger the discrepency in size. I love how people always mention how big they are in the picture. 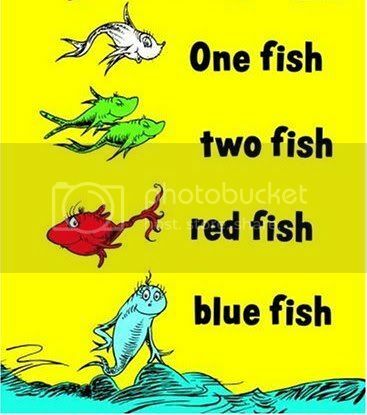 If you claim you are taller and wider in built, it also implies your arms are longer and the fish is held out further...which means the actual size of the fish is actually smaller than it appears. It works against you...not for you. That means the fish is 19.8" (round up)...Which is what I estimated without doing all that silly photography and calculation anyways. Again, I'm being generous here assuming that the fish was ONLY held out 12" from the face. All that to say...the smallies looks to be 4-5lb fish...and people should not overestimate an Ontario record breaking fish length without a tape measure...because that estimation certianly looks fishy. A 31" smallie it isn't unless you can show some pictures of the fish beside a tape. While we were fishing, a family came by. First it was the mom with a 2 year old boy. She was interested to find there were fish in this "dirty" river. Soon I was able to catch and show them a healthy White Sucker. The 2 year old was a bit unnerved by the fish. However, his older brother came to join us. As in my typical fashion, when kids are around, I work hard to try to get a fish on the hook and then hand off the rod. Dave said I have a touch for catching fish on demand for kids. Indeed, it only took the next cast to get one. I handed the rod to the boy and with some coaching he was able to bring a nice White Sucker to the bank. It was his first fish ever. Or you can always just ask me if I am free and I would meet anyone there. I usually do my stocking up around this time of year. I thought I would just toss out what basic bass setups I have and maybe you guys can reference some of my specs to yours or maybe for future you may want to try out some of what I have to offer in terms of specs. Keep in mind guys, I typically use 40-65 lbs braided line with 25 lbs fluorocarbon leaders UNLESS I am using a crankbait stick in which case you may want to have a full line of 10-12 lbs Seaguar Fluorocarbon. Also for spinnerbaits I use straight braid and do not use a swivel! It can actually take away from the action. I use an open loop and tie my knot directly to them. Can use this for dragging football jigs as well as a carolina rig. Can also work small-mid sized swim baits. Not clear whether this is a capital generating venture...nor what practical function this will have by way of protecting fragile watersheds. Not a business guy and this is not my site so I will defer on the former. As for the latter, suffice to say that there are numerous other fora that openly discuss access to southern tribs...the exercise here then is moot and will effectively create a two-tiered forum. Not sure whether I subscribe to that. It might also be noted that a quick pm to those whome you trust to have good discretion has always been the best way of marshalling a group of such anglers to meet up for time on the water...although sharing information about fragile fisheries with those you "trust" to be discrete doesn't always work out either (human nature brothers and sisters). salmon arent that hard on a CP. Sometimes you get the super hot fish that you dont stand a chance with but I landed quite a few salmon this season in less than 5 minutes on a 4-8lb 13'4 rod. RIGHT IN THE MOUF! Why not just ban photos then. Geez.. "I recognize that tree! There goes the river." I guy can't share a photo without being critisized. Just ban it all together then. The forum will be so much more fun. Let's keep it reasonable boys. SOUNDS LIKE A MAN who is reasonable! Recently I went fishing for suckers and made 3 posts relevant to the situation. It appears that this topic has caused (2) threads to be LOCKED. I can only hope that this thread will remain open ... allowing for intelligent conversation. If not ... Would having 3 threads in a week closed be a record at OFF? So.... I published an HONEST ACCOUNT of my day of fishing. Does this seem like a conspiracy of someone trying to “Beat the system” or hide their actions? I take it that all my hundreds of positive posts and topics and contributions were all part of an eleborate scheme ... to fool the TROUT MAFIA? Apparently, trout is the ONLY SPECIES of any importance. The same “Ethical Know it alls” are often seen throwing Chub& Suckers & Carp up on the shoreline to DIE. 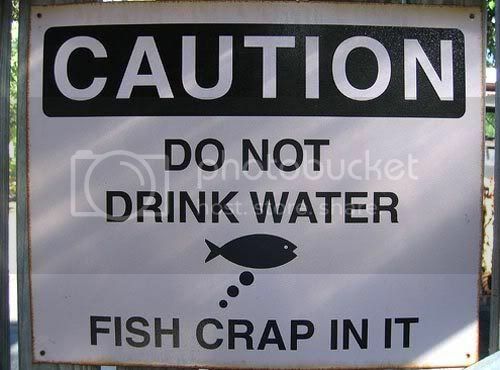 Guess the “TROUT ONLY SIGN” on their offering was ignored. Same guys who assume that anyone not using a CENTRE PIN...must be a loogan, poacher or snagger. Every year at BRONTE, CREDIT, HUMBER, WILMOT ... Bowmanville,I see the CARNAGE left on the shorelines. Considering the number one choice of bait for Steel headers is ROE.... there would be absolutely no coincidence of association here, would there? Seeing the BROWNS slit open is especially disheartening. Course only a “STEELHEADER” of high moral fortitude would even imagine that the BROWN ROE is the BOMB.... right? My intentions were for catching SUCKERS. I really do not need to justify anything to anyone. Subsequently, I have not fished for suckers in any “Closed Trout Area”. Bass, Suckers, Chub and TROUT! This weekend, I will go out and do the same. I can only hope more of us will get out and enjoy the wonderful opportunities out there. Since around mid August 2011 ... this site seems to be on a DOWNWARD SPIRAL. Almost every other post involves some NEGATIVE COMMENTS. There are certain individuals who "lead the pack" in these matters. and those who seem to "Feed ON" this kind of behavior. -Jumping on people about "Secret Spots"
“SALMON” and “FISHING EXPERTS” ? ...."Know it alls"
This MUST come to a stop! The MODERATOR(s) even confirmed that "Some" of these individuals were BANNED. Hopefully when OPENFIRE returns from vacation, this can be remedied. You would rarely see ( –minus reputation points) being so randomly handed out. “Thankyou’s” were given to those individuals who took the time and courtesy to receive them from fellow CONTRIBUTORS. Not anymore! What a shame. I would hope that the MEMBERS of this SITE will take action(s) and put a stop to this nonsense. I have had enough of this and from what I have been reading & seeing lately, I know most of you have as well. Why are the Posts/ Reports down? Why are people getting fed up and leaving (including myself)? Why are there so many -minus reps? Why do people get +1 for crude remarks and inappropriate opinions? no need to leave cos u get menus ratings, it is the internet all kinda jack offs out there. I had my posts rated - few times last week but i don't let it get to me after all this is the internet lol.